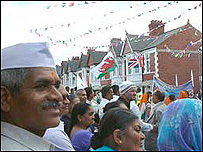 Around 3,000 Hindu worshippers have paraded through Cardiff to mark 25 years of their faith in the city. Members of the Shree Swaminarayan temple in Grangetown joined members of the religion from across the UK for the 1.6 mile (2.5km) march. The procession, which were shown on the web, was the culmination of a week of events also being held to celebrate the redevelopment of their temple. Representatives of other religions in Cardiff were invited to join them. They said they would be delighted if local people also took part or watched as they paraded from the civic centre, past Cardiff Castle and the Millennium Stadium to their temple in Grangetown. Before the anniversary parade, Nanji Vaghani, a member of the temple's committee, said: "We want to show we're part of the community and that we're here to share our faith with everyone. It will be a parade full of music, colour and dance." Roads were closed during the parade, and reopened as it passed. The celebrations have included the installation of new marble idols in the temple - an integral part of the Swaminarayan faith - which replace the picture idols that had previously been used. The faith's spiritual leader, His Holiness 1008 Acharya Maharajshri Koshalendraprasadji Maharaj, also attended the celebrations. The week's events have been broadcast live over the internet, for the first time in the temple's history. "I know we have people from all over the UK and as far afield as Australia watching," said Mr Vaghani, 35, from Grangetown. "Other temples have broadcast their celebrations on the internet before but this is the first time we have done it. It has allowed us to embrace everyone. "Hopefully we will be able to do it again in the future." 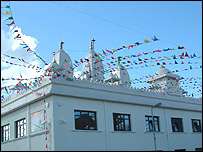 The week has also marked the redevelopment of the temple, which now has elaborate pillars on the roof - known as sikhars. 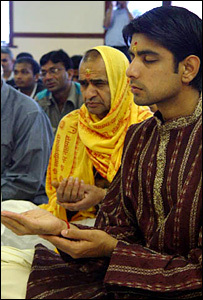 Members of Shree Swaminarayan have been worshipping in Cardiff since 1982. In 1993, they moved across the road from their first temple to their current site and held a similar march through Cardiff to mark the occasion.